We are most definitely a coffee culture. In my neighborhood, there are five coffee shops all within shouting distance of one another right around the corner from my front door, each one filled to the brim with happy clientele at any given hour of the day and night. I do love the rich flavor of coffee, so naturally coffee desserts rank right up there with me. 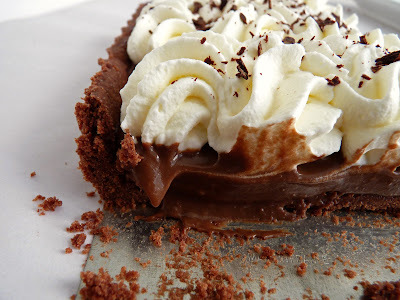 And since I’ve been thinking about desserts that bring a special lusciousness to the table, chocolate cream pie with an adult twist seemed like a good project to work into my repertoire. This Mocha Cream Tart is absolutely bursting with the heady combination of coffee and chocolate. For java lovers, it's a dessert that will have you wondering if you’ve truly gotten every last possible morsel off your plate. This story begins with chocolate tart dough from the Baking with Julia cookbook. It’s super tender and crumbly, so handle with care. The tart is filled with a pastry cream that’s loaded with big coffee flavor and some dark bittersweet chocolate. The custard is very silky rather than stiff. Then to top it all off, the tart is finished with whipped cream flavored with a little bit of sugar and rum. The end result is crumbly cookie crust, creamy custard and luscious whipped cream – a happy trio of great components all in one dessert. The tart takes some preparation time, which is quite easy to carry out over two days. Prepare the tart dough in a food processor, press it into the tart pan and make the mocha custard. Chill both overnight. Bake off the tart shell the next day. Cool and fill with custard. Garnish with whipped cream and serve. 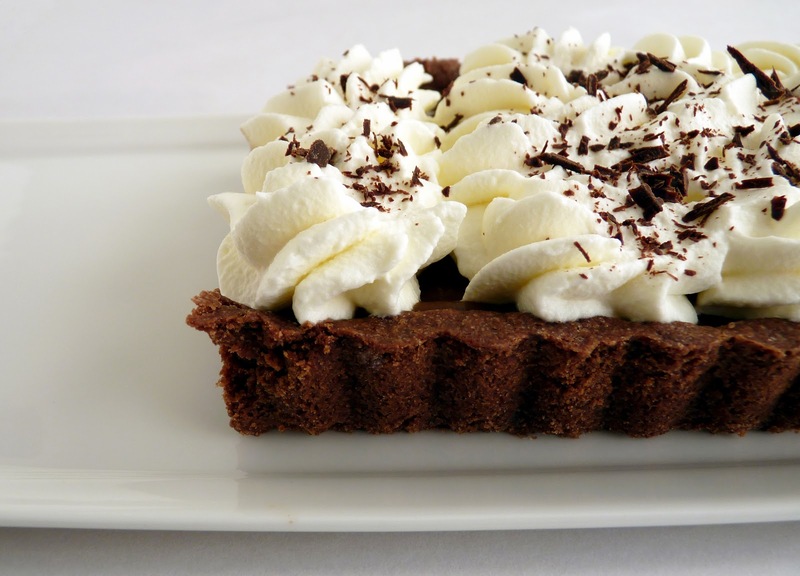 An update to an old classic, next time you feel like a caffeinated version of chocolate cream pie, present this Mocha Cream Tart on your table and watch it disappear with instant abandon. 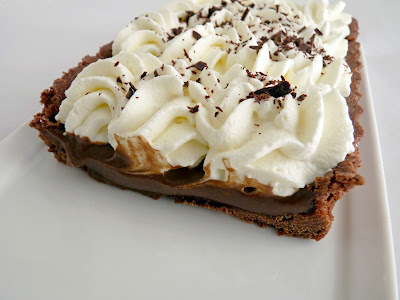 - I found the chocolate tart dough a bit dry, so you may want to add just a tad bit more water. Make sure you do the fraisage step – smear the dough across your work surface with the palm of your hand a couple of times until it comes together. A bench scraper is useful for helping to gather up the smeared dough. - I didn’t find the tart dough easy to roll out so I just pressed it into the tart pan. Just be sure to try and press the same thickness throughout so it bakes evenly. Once the tart is formed, I chilled it in the refrigerator overnight to minimize shrinkage. If you’re short on time, you can place it in the freezer for 1/2 hour. Be sure to dock the bottom of the tart shell several times with the tines of a fork before baking. - The custard should be made one day in advance to allow it to set up and the flavors to strengthen and meld. - For the custard, I use coffee in 3 different forms: dark roast whole beans, instant espresso powder and Kahlua liqueur. For a less strong coffee flavor, eliminate the Kahlua and cut back on the espresso powder. - This custard is silky, so it will loosen up as the chill wears off. If preparing ahead, keep it refrigerated until ready to serve. - If you’re not going to serve the tart soon after it’s assembled, the crust may get soggy. To prevent that, brush a thin coat of lightly beaten egg white on the bottom and sides of the baked tart shell and bake for an additional 5 minutes. This helps to "seal" it. You can also brush it with a thin layer of melted chocolate and let it set up before filling with custard. - No need to pipe the whipped cream on top of the tart. Just swirl it on with a spatula. - If you use a 14” x 4” rectangular tart pan as I did, you’ll have a little bit of extra tart dough and custard. You can bake off the spare dough as cookies for a nibble. Lightly grease a 9” tart pan with removable bottom. For the tart dough, place the flour, cocoa, sugar and salt in the bowl of a food processor. Pulse to blend. Add butter pieces and pulse 8-10 times, until pieces are about the size of small peas. Add yolk and ice water and process in short bursts until crumbly. Turn it out onto a work surface and smear the dough across the surface with the heel of your hand a couple of times, then use a bench scraper to gather it together. Working with a few pieces at a time, press it into the bottom and sides of a 9” tart pan, making sure it’s an even thickness throughout. Chill in refrigerator overnight. To bake the tart shell, preheat oven to 350 degrees. Prick the bottom several times with the tines of a fork. Bake for 15 minutes or until the dough is dry and firm to the touch. Cool on a wire rack. For the custard, place the milk, coffee beans and brown sugar in a saucepan. Bring to a slow simmer over medium low heat. Stir in the espresso powder and Kahlua and remove from heat. Cover and steep for half an hour. Finely chop the chocolate and place in a medium bowl. Cut the butter into very small pieces and add to the chopped chocolate. Set aside. When the milk and coffee mixture is sufficiently steeped, whisk together the egg yolks and the granulated sugar until lightened. Add the flour and cornstarch and whisk thoroughly until blended. The mixture will be thickened and lemon-colored. Re-warm the milk and coffee mixture. Strain half of it into the egg yolks, whisking quickly and thoroughly. Strain the remaining milk and whisk. Return to the saucepan and cook over medium low heat, stirring constantly, until mixture comes to a slow boil and thickens. This will take about 1 – 2 minutes. Continue stirring and cooking for another minute until smooth and thick. Pour through a clean strainer into the bowl with the chopped chocolate and butter, pushing the custard through with a rubber spatula. Let it sit for a minute or two and then slowly whisk to incorporate everything together. Add the vanilla and salt, to taste. Mix thoroughly and pour into clean container. Press a piece of plastic into the surface and refrigerate overnight to set up. To assemble, whip the heavy cream with sugar and flavoring of choice until it holds a medium soft peak. Fill the tart shell with custard. Gently remove the tart from the tart pan. Pipe or dollop swirls of cream on top of tart. Garnish with chocolate shavings. Store in the refrigerator until ready to serve. Yum! I love anything mocha. Great recipe! 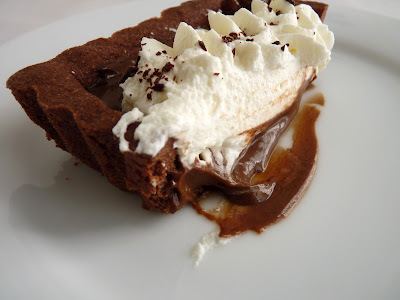 Tried this mocha cream tart and it is absolutely divine. It is so delicious and everyone loved it. Hello Courtney and, Spend Well Media, thanks for the instant feedback. I'm tempted to call this the Disappearing Tart! Enjoy! For some odd reason, I've never liked coffee. I make it for my family, but always have tea myself. However, the exception is in desserts. I love coffee ice cream and think anything chocolate sings when coffee is added. This looks delicious and make-ahead is always on my radar. I started making this tart from the BWJ book years ago, and I hadn't realized until I saw your recipe that I'd strayed from the original over time--using more chocolate, rum instead of Kahlua, finely ground espresso instead of the coffee + instant...it's a great and popular dessert, thanks for reminding me of it!